← We’ve got knitting AND goodies! Why is it that whenever I am nursing Knittybaby and he is just about asleep that Little Man has to get into something? Tonight it was the plunger in the toilet, and the thing is I know it’s his plan to try to get me out of the rocking chair. The question is always, how bad of a mess will it be? Do I risk it, get Knittybaby to sleep and then go check? Or do I give in and see what he’s up to and then start all over again with Knittybaby? I hear splashing sounds, flushing, and the rolling of toilet paper. Knittybaby’s eyes have been closed for about 30 seconds, this could get bad…what’s the worst case scenario? I ponder, and the answer comes as suddenly I hear thumping sounds and see a wet plunger is now being waved about my head from the staircase. I plop Knittybaby in the swing in hope that he will magically fall asleep, retrieve plunger, wipe floor, discuss rules of plunger use, and thank God that the toilet was not plugged and had actually been flushed before he decided to plunge. And now Knittybaby is wide awake. Which is why I don’t have my baby blanket swatch to show off to you tonight. Sigh. 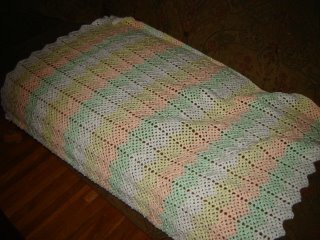 But I do have a picture of the lovely crocheted baby blanket that a dear family friend gave us last week. I have known her since I was Little Man’s age, and though I rarely see her and her family anymore she has still given me a blanket for both my boys. I love that it has orange in it! Finally, things have been a little grim around this blog with Knittybaby’s bad news, so I’ve decided it’s time for a little fun. Contest coming soon!!! Oh, I’m just learning (thru niece) how challenging getting a baby to sleep can be, so I sympathize! Well, at least no fruit was involved – my older brother flushed an orange once and my father had to take the toilet apart to get it out. what a beautiful gift! would love to see a picture of your greyhound, I just posted a new one of (one) of mine! Toddlers are drawn to toilets. When my neice was two she decided to try to flush a bunch of my son’s action figures. Now that made for some family fun. I’m sure that Knittybaby will be just as drawn to putting inappropriate things in the toilet when he is a toddler. Oh man, my sympathies! I have just gotten to the point now that my “baby” is nearly 2 that I don’t have to worry about my almost 4 year old bothering her sleep habits. I feel for you. I used to be quite adept at the one-handed rescues. I’d jump up with the baby on one arm and be dealing with the then-toddler with my free hand. It won’t last forever, I promise! With kids, just when you get used to something or totally sick of something it changes anyway. Nursing is the best, and kids do grow up. 🙂 My personal rule is that I won’t do anything resembling chores during nap time. That way I’ve always gotten at least a little time to knit every day.